Paige Walker has been in love with her brother’s best friend Jake Romano for what feels like her whole life. She expressed her feelings once, as a teenager, and was politely rejected, and has hidden those feelings since. Paige, and her two best friends, after being fired from their jobs, open their own business. Jake and her brother, both successful business owners, pitch in with advice, but it’s not until Jake hires Paige’s events coordinating business to throw a party for his company does their business and their feelings take off. This trope of girl falling for her brothers best friend is not new. 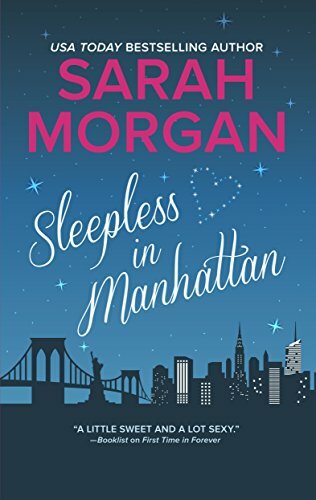 However, Sarah Morgan writes a charming, sweet and fun romance that was enjoyable to read. Paige’s feelings of wanting to success without the help of anyone, I think is something that most of us can relate to, and who hasn’t had a crush on their brothers best friend? I was a little younger (8 or 9), but I can remember following my brothers friend David around intruding on their frog catching. Something that my sister brings up occassionally, but thankfully not often. Unlike Jake, he never returned my feelings, but it’s a dream that probably most of us had at some point in our young lives. In Sleepless in Manhattan, we get to live that dream through Paige and Jake, and actually find out why he rejected her when she was young. We can also relish it more when they get together. If you want to relive your childhood crush through Paige and Jake, but also relish a happy ending, pick up a copy of this book. This is the first in the series, From Manhattan with Love.